It may be time to break out your blues. The date of the semiannual uniform change over from whites to blues is set by each of the 12 Navy regions, but wide swaths of the U.S. are changing over now. Blues became the official dress uniform for sailors from Maine to Maryland on Monday, just in time for a cold snap hitting the east coast. Sailors in the Washington, D.C., area are also switching to blues. But sailors in North Carolina and Virginia will have to wait two more weeks, until the third Monday in October, to don their blues. California sailors will switch on Nov. 7. The southeast breaks into two separate regions, along a straight line from Midland, Texas to Savannah, Ga. Sailors to the north of this line switch on Nov. 7; sailors below it will switch over on Dec. 5. “It’s going to be different for every region” said Capt. Jacqueline Yost, spokeswoman for Navy Installations Command, explaining that it is based on the climate. Alaskan sailors changed over when they went back to work after Labor Day, as did those in Washington State. 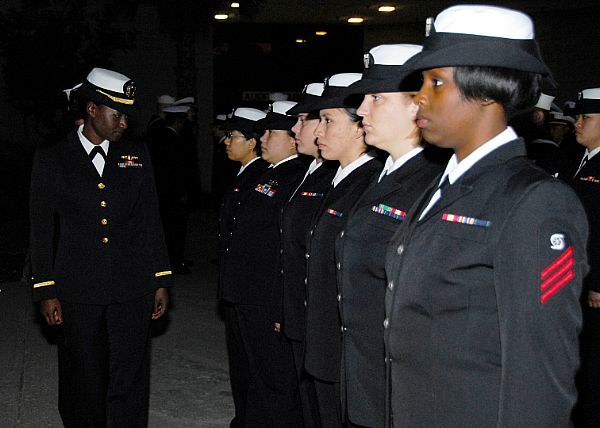 Other sailors don’t need to worry about it, though: sailors in south Florida stay in whites year-round.